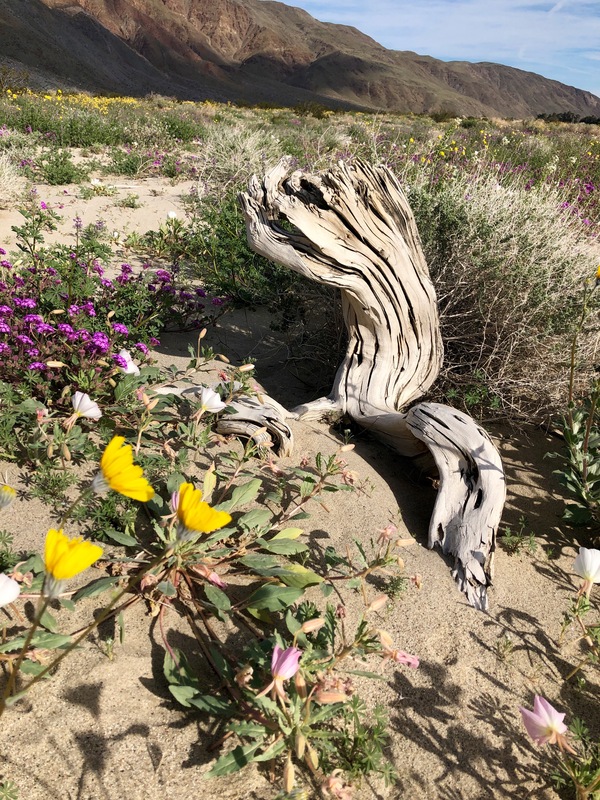 On Stage Now – The Super Bloom of the Desert! The desert displays many faces. 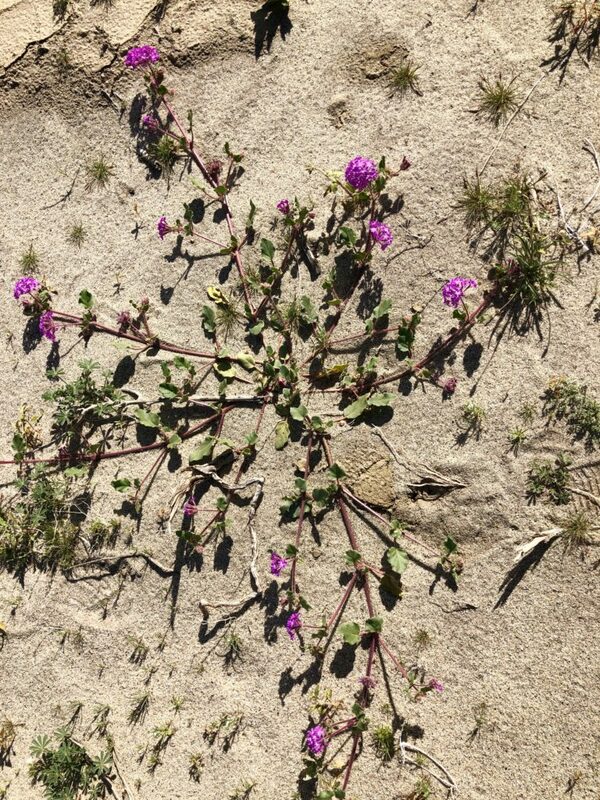 It can be bone dry and desolate, or raging in color and life, like it is this spring. 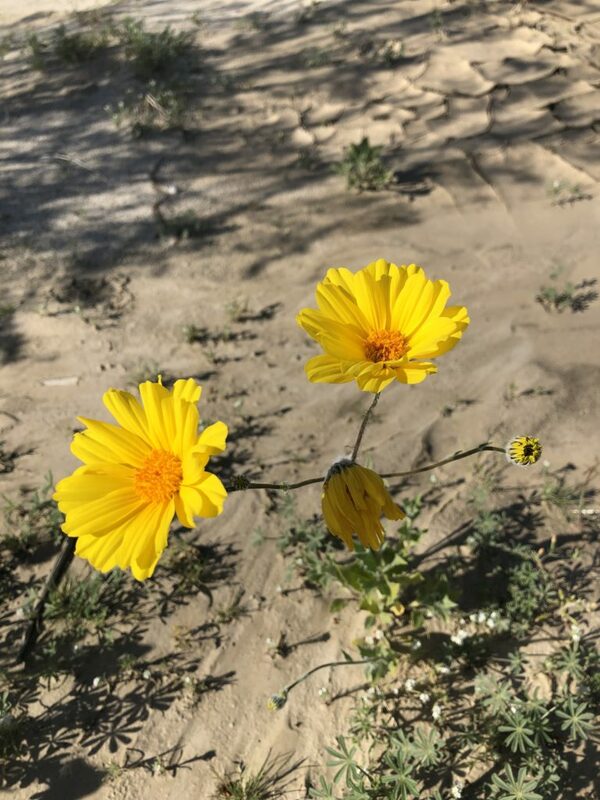 It’s called a Super Bloom and only happens when an abundance of rainfall gifts its precious resource to the parched land. It’s wildflower time! 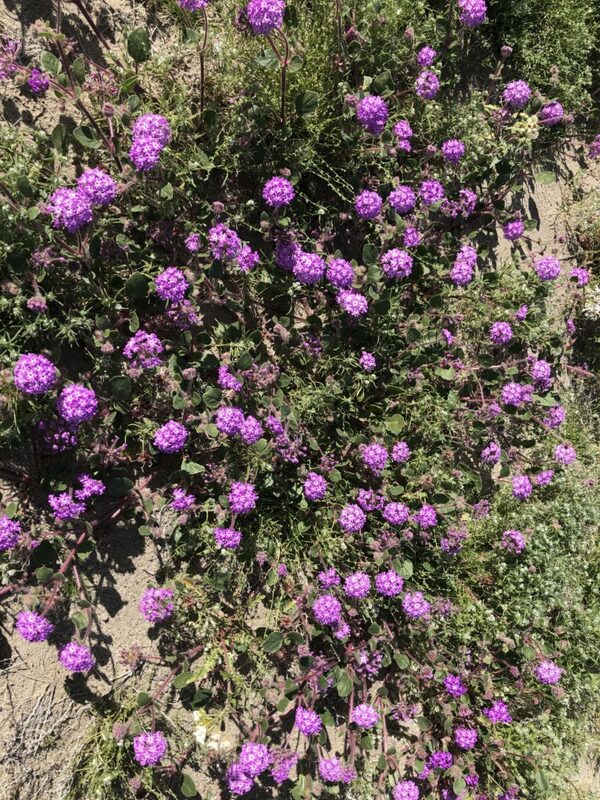 I want to show my Portuguese visitor, Luís, the best of southern California and it is curtain call for the wildflowers at Anza Borrego desert. We drive through ranchlands in back country San Diego, along with my pal, Sparky, to the Visitor’s Center in Borrego. 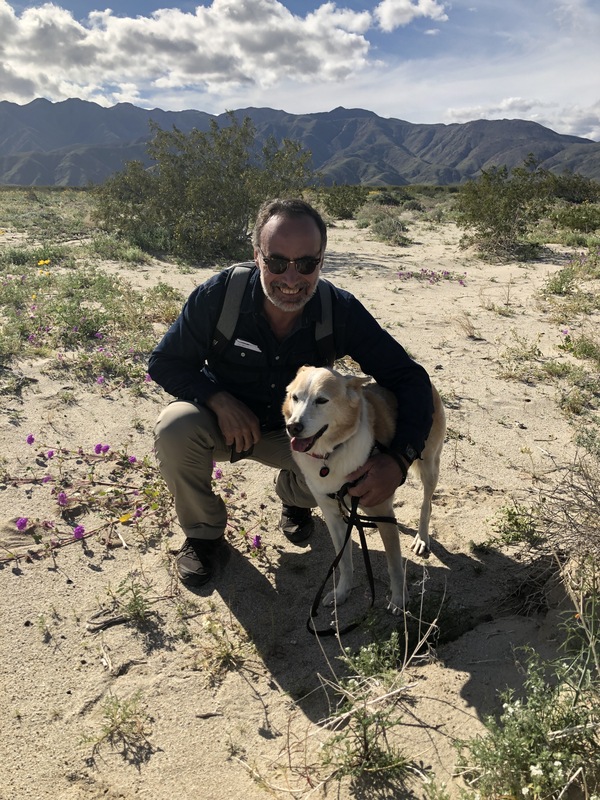 The rangers direct us to an area known as Garden Desert for the best flower show and because it is dog friendly. Luís and Sparky enjoying a moment. The road we follow is lined with orange groves and faces the open desert landscape. It’s a dichotomy of lush fruit trees paralleling the dry, wind-swept desert floor. Warm-to-the-touch breezes gently guide us in, toward the mountains. I am one with the wind, feeling the vibrancy of life. Sweet scents of orange blossoms mingle with the more stringent creosote bush and collide with the delicate fragrance of tiny white flowers, reminiscent of jasmine. Carefully, I traverse the pathways, trying hard not to step on the multitude of flora. I gather a handful of pink flowers and nuzzle their bouquet to my face, breathing in their faint, sweet scent. I feel insignificant compared to all this activity, just a passer-by in a flash of time. 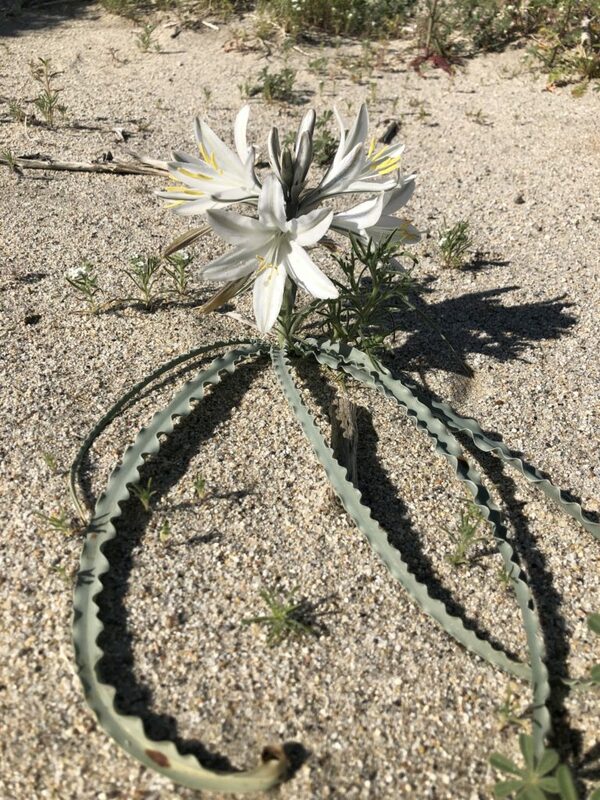 A Desert Lily captures my attention. 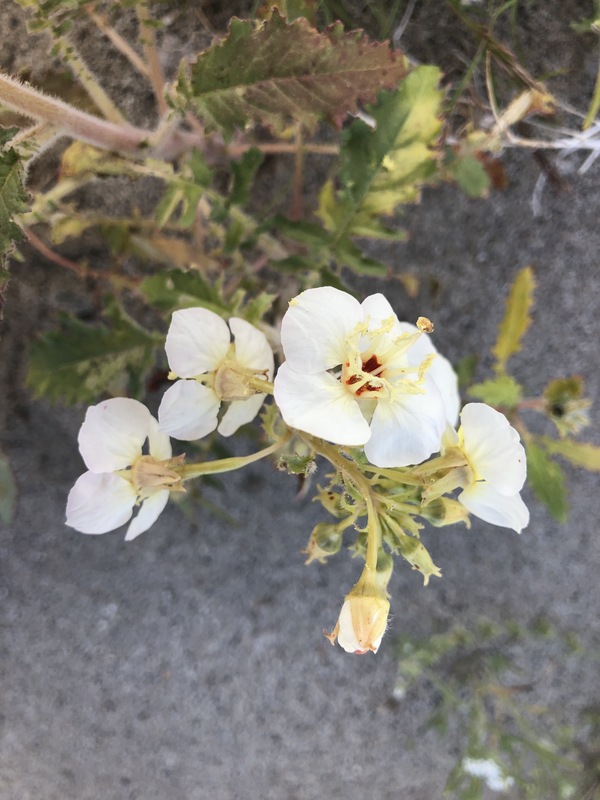 She almost evokes a religious element, she is that perfectly crafted, her arranged and spiked leaves protecting the delicate white bloom that is her pride. No longer living a life of obscurity, these flourishing plants flaunt their brilliance, basking in the limelight, if only for a short time. Tiny animal footprints – rabbit? 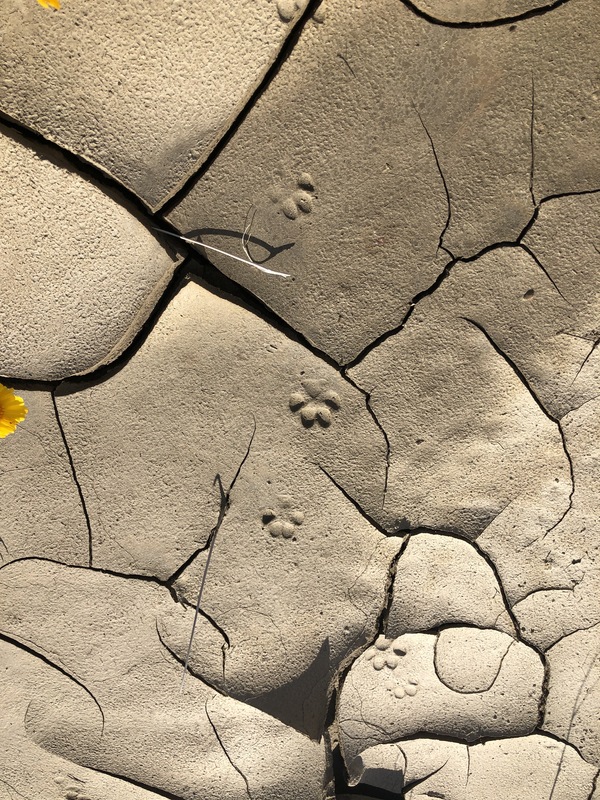 – solidly cast in dried, cracked mud follow a path along the wash. I wonder if all the desert critters frolic and rejoice under the moonlight, celebrating this phenomenon? I stop in the middle of this polychromatic carpet and close my eyes. 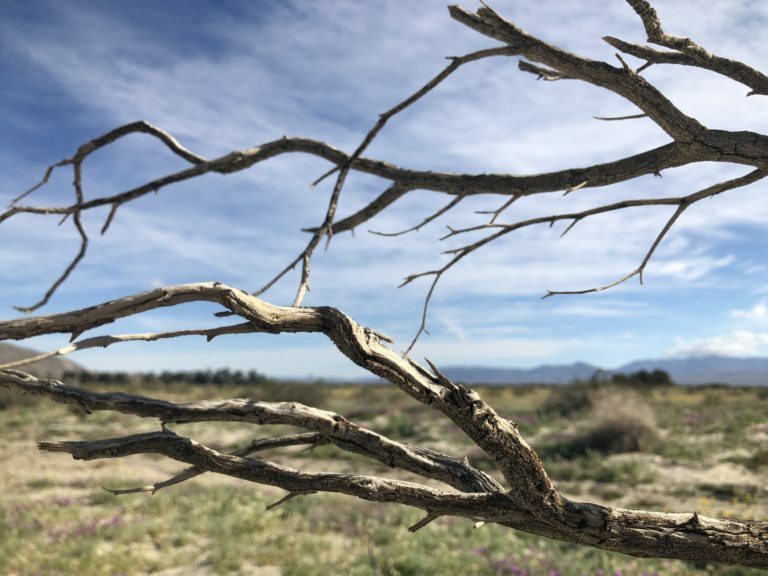 The voices of nature are the only sound: lofty creosote bushes sway and comingle, the friction of their branches release a rustle as well as the scent of camphor that fills my nostrils. Lower lying flowers dance with the winds and whisper to each other. Sparky’s eyes close as he drinks in the quiet. I feel grounded, like roots are sprouting from my feet, connecting me to the next layer of life. A feeling of peace overcomes me, knowing that all things are possible. 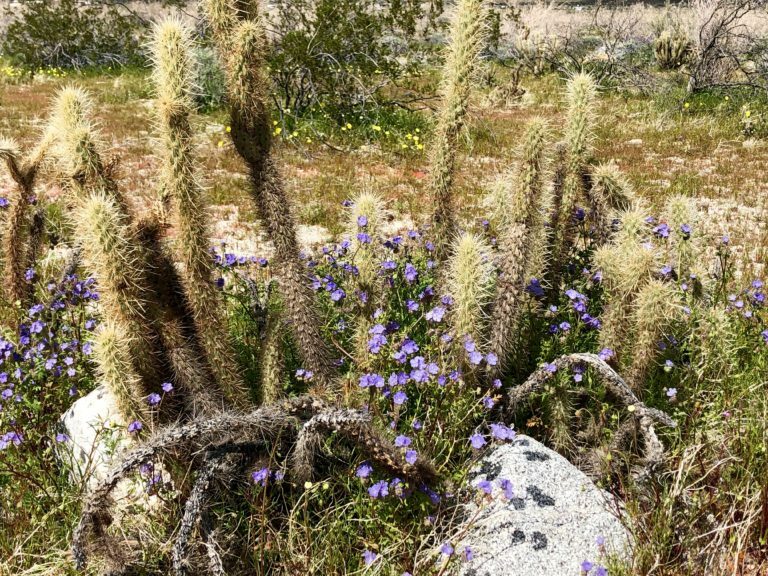 Hope springs from the harshest of challenges and the desert perseveres. Soon the show will end and they will fade and retreat underground until Mother Nature grants their freedom once again. Thank you Borrego for a brilliant performance!